Sweaty work: Hammering away the deck. It was really tough work to get rid of that old deck. I had to hammer it off with a heavy chisel centimeter by centimeter. A kind of brutal effort to get the stuff off the GRP-structure (here´s a complete article on the first milestone of my refit-project). When roaming the Hanseboot-fair I took a lot of close ups of modern sailing yacht´s decking to get an impression of nowaday´s workmanship and of course I visited several stands of decking companies offering their products and services. Since at least then this very question was inside my mind: Should I go for real Teak or artificial plastic stuff? At the stand of Rosch Yachtservice I got the chance to talk to Ralph Schiecke who was answering my thousand and one questions and offered me a visit to his company, which I took gladly to get to know more about Teak-Imitation for a yacht´s decking, what it is made of and how it is produced and adjusted accurately for every individual yacht. Real wooden Teak-Deck: A thing of the past? Many Companies, so much Brands. What are the differences between the PVC-decks? The bare blocks on big rolls. Another aspect are the gluing characteristics. Something one wouldn´t think of initially. 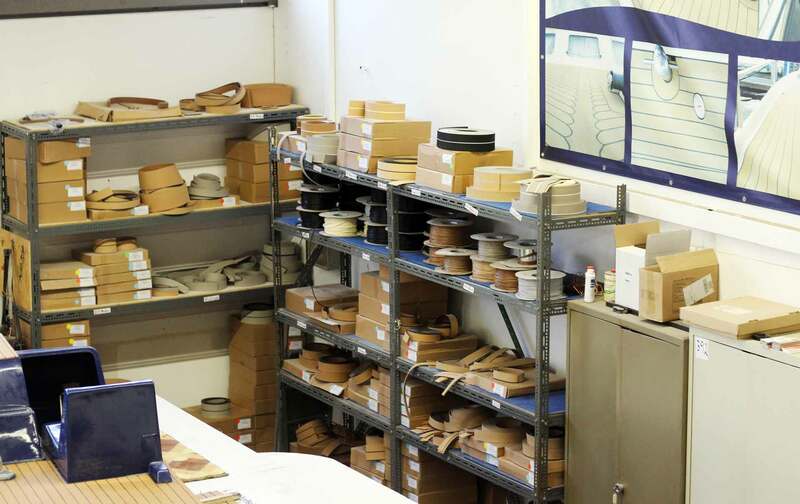 “Before we offered our own Rosch-Decks we have been into the refit-business for several years. We have been able to collect invaluable experience with applying the products of our competitors. And what was bothering us most has been the somewhat floppy performance when it came to gluing the stuff to the GRP-surface. We found out it was due to the structure of the backside of the PVC-blocks. 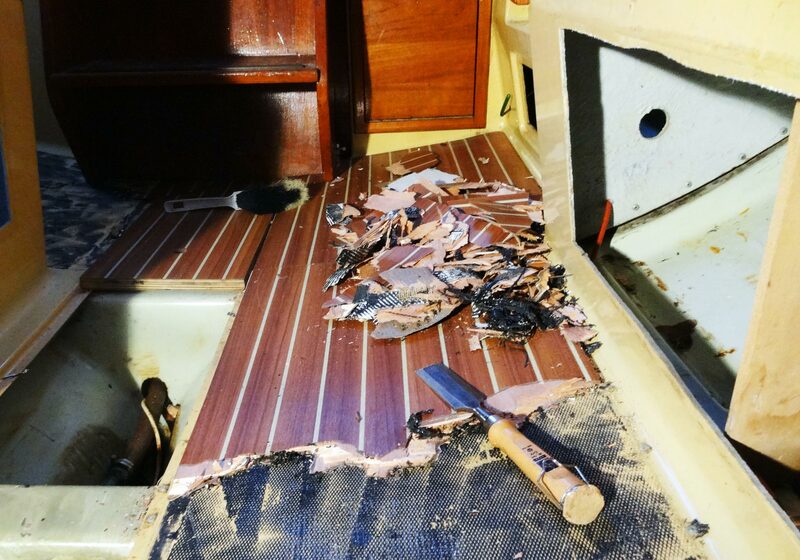 They simply wasn´t forming a solid connection with the boat itself.” Rosch-Deck has a somewhat finer structured backside with way better adhesive characteristics. 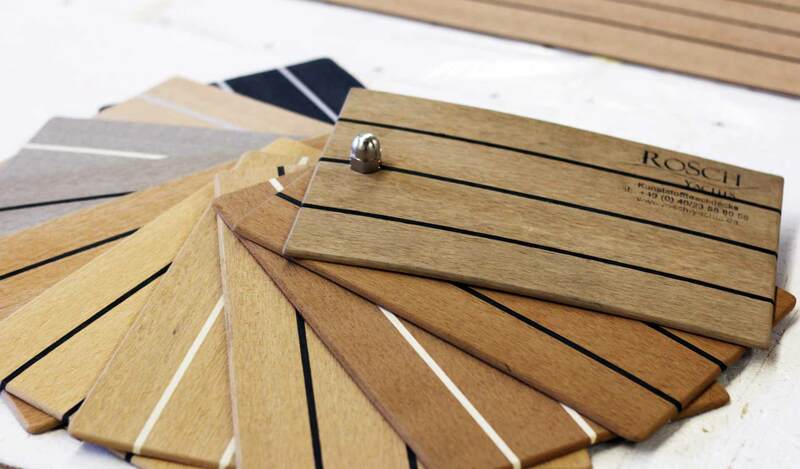 “We could prove that our decking has far better adhesive properties thanks to this innovation.” A solid connection to the boat also insures a long lasting decking in the end. A lot of different materials to choose from for the perfect deck. Taking a sightseeing tour in his workshop Ralph shows me some patterns of past projects. This is how every single new synthetic decking begins its life. “The principle of utilizing patterns is the same with all products on the market”, Ralph says. “The client will make a 1:1 pattern of the whole deck on his own and send it to the company. The easiest way is to buy a large roll of thick brown-paper and cut it into form with a scissors or carpet knife. This technique is well-proven with small projects.” A clear disadvantage could be that you have to work very precise which could cause rookies to re-try the cutting of one pattern a few times. Besides, brown-paper can get wet easily and rip apart. It´s just fragile. But that´s virtually negligible for my own refit-project: Because I do want to renew my internal decking I do have only small parts to cover and don´t have to be aware of moisture. It´s a different talk when it comes to bigger ships and external deckings. “Clients can opt for a pattern-making service done by our crew. When we do the patterns we use transparent plastic canvas. We will roughly cut them to size and will then mark with an Edding the edges of the deck. You can virtually see when you make a mistake and correct it. No need to cut or restart. We achieve very accurate patterns with that technique.” Vapor-Barriers as used when building houses is the material of choice here. 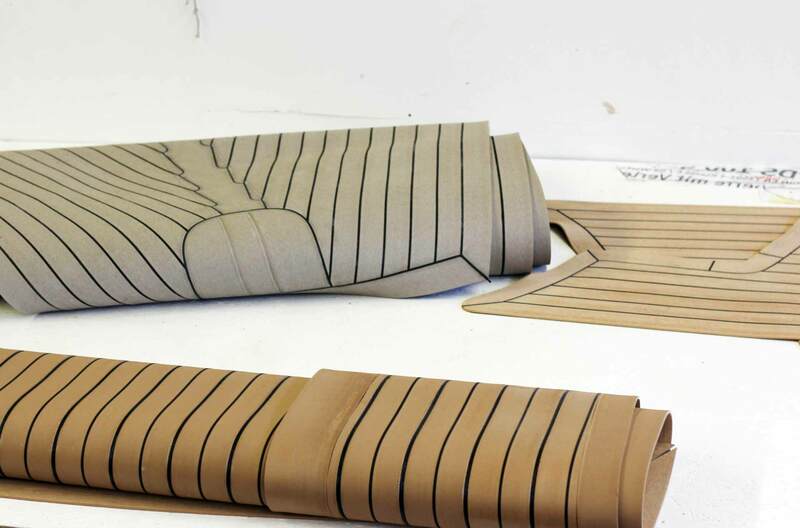 When the patterns arrive at the Rosch workshop they will be spread all over the huge working table. 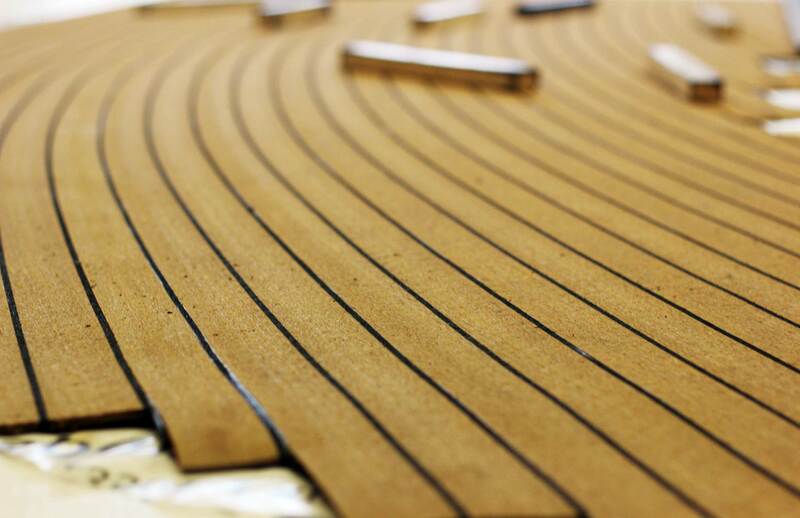 “The main thing, especially with bigger decks and bending blocks are referential markings which show the longitudinal axis of the ship on which we will adjust the decking.” That´s logical: Only in such way a decking can be produced thoroughly. “The blocks will be roughly cut and brought onto the pattern. The caulkings will be applied and welded to a solid unit.” Next step would be the fine cutting of the whole deck into the exact size and, if the client opted for it, the production of a haunch. When done properly the whole decking will – for the first and probably the last time of its life – be sanded smoothly and thus receives its final design. 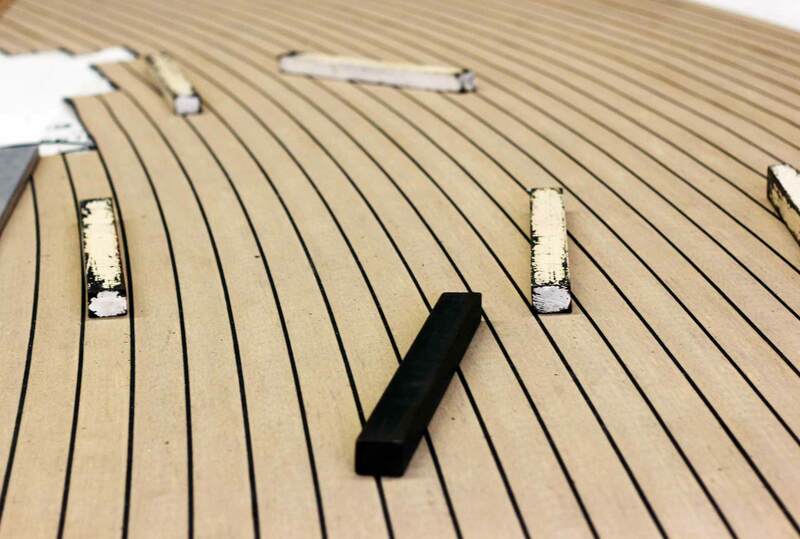 How expensive is a Yacht Deck made of synthetic Teak? Embarrass de Richesses: Which color suits my Ship? Choosing the right color can be a tough task. I drive home from Rosch Yachtservice with a rich and clear picture of what to do. 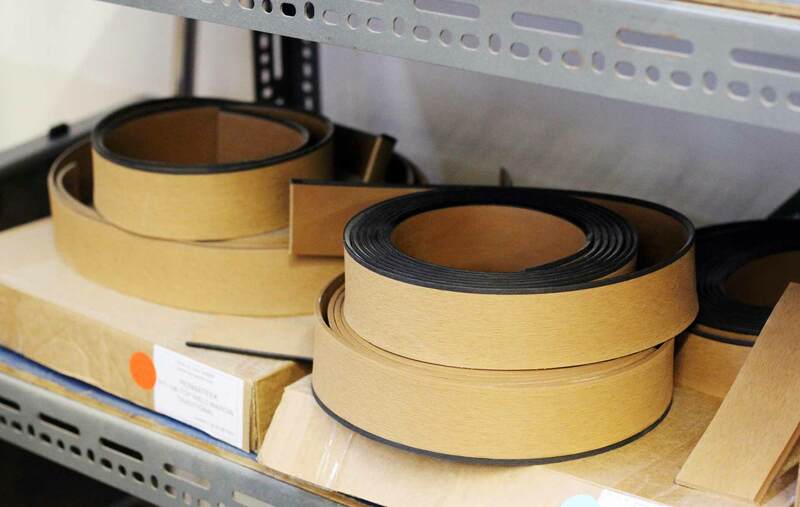 A roll of thick brown-paper is bought quickly. We have made our choice for the color of the new decking. And found a reliable and trustful partner for that milestone. But before the new deck can arrive, I do have some other steps ahead first: A new electrical wiring including an LED-lighting and of course the GRP-repainting. The next article on my refit-project of the new decking will sho how I produce the patterns and my new deck will come into shape at Rosch´s working table. A big “Thank you!” to Rosch Yachtservice and Ralph Schiecke. If you want to know more about his product and service, don´t hesitate to browse to his Website or make contact. Something to think about. Looking forward to your updates! Great stuff as always Lars. I don’t really get PVC-decks. I mean sure, they make more sense than teak decks which are like a disease no-one is willing to cure.. But to make it clear: advantages of teak: nonslip, insulation (for chilly environments) and possibly the look. Disadvantages: maintenance, cost, weight, gets uncomfortably hot in the sun. To sum: I wouldn’t wan’t own a boat that caught the plague of teak. PVC advantages: Lack of maintenance, durability. PVC disadvantages: Lesser insulation in chilly weather yet many get insanely hot in the sun, expensive. To sum: doesn’t seem to provide any real advantage over much more affordable paint on nonslip apart from looks. But has disadvantages in warmer climates. Interesting aspect, my friend. Maybe I´ll gather some more info on Kork-decking and prepare an article on this?